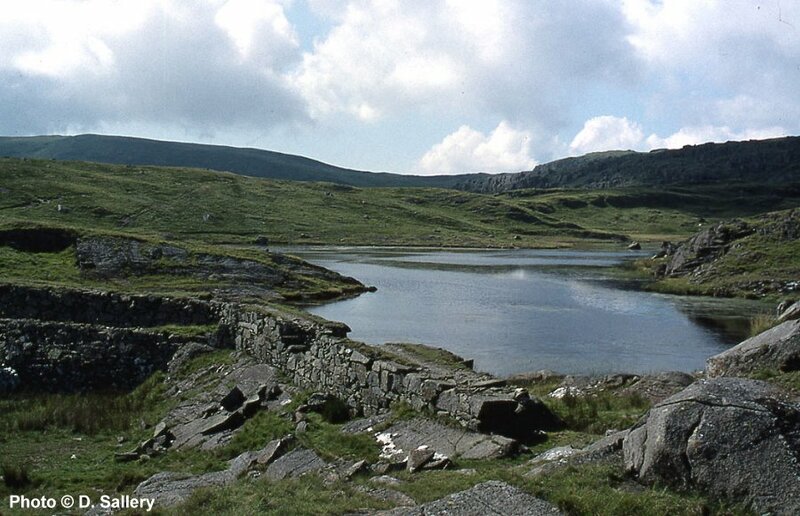 This is Llyn Cwm Corsiog to the north of the quarry. It is a purely artificial reservoir, created in 1899 to meet the increasing demands for water power. The lake covers an area of nearly 8 acres and it is impounded by two dams separated by a rocky outcrop. One of the dams can be seen in the foreground. This lake and others in the area are now used to supply a small hydro-electric plant in Tan y Grisiau. The other great attraction of water was, of course, that it was free. In an area with one of the highest rainfall totals in the country it was often embarassingly plentiful. Much of the harnessed water power was used to remove large quantities of untamed water seeping into the underground workings. A constant battle was fought to ensure the workings remained dry and accessible. Ironically it also became common practice to use abandoned and worked out chambers as further reservoirs. One of the smaller reservoirs built to supply the quarry. It was not all plain sailing though. Because of the height of the quarry in relation to the surrounding catchment area it meant that there were few readily available lakes to tap. 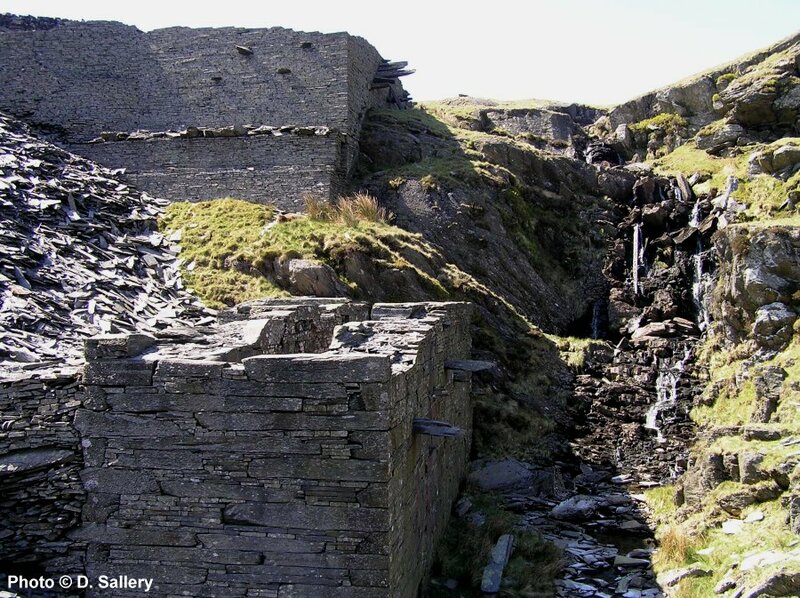 The construction of reservoirs and the supply of water to the ever demanding water wheels assumed an importance to the quarry second only to the production of slate. There were ultimately twelve reservoirs available to supply the quarry. Some more successful than others. However, despite the complexity and ingenuity of the supply system there were still times of drought when production ground to a standstill through lack of water. The winter months also brought problems when any prolonged period of frost would result in the entire supply system freezing solid. Some of the lakes and reservoirs remain today while the presence of others is marked by the collapsed and decaying remains of dams and abandoned water courses. 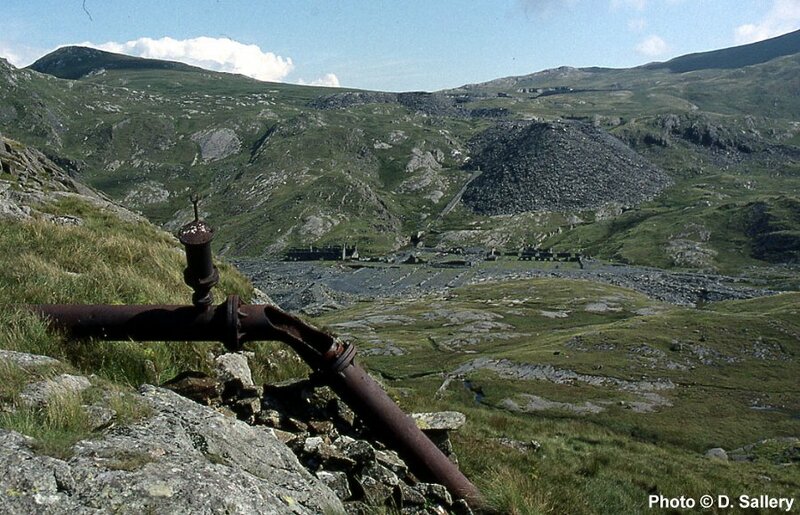 With the quarry prominent in the background, the remains of the outlet pipe from Llyn Clogwyn Brith can be seen here. This lake was natural but its level was raised by construction of a dam which can still be seen today. The main function of the reservoirs on the north side was to supply the main mill and dressing shed on level 9. 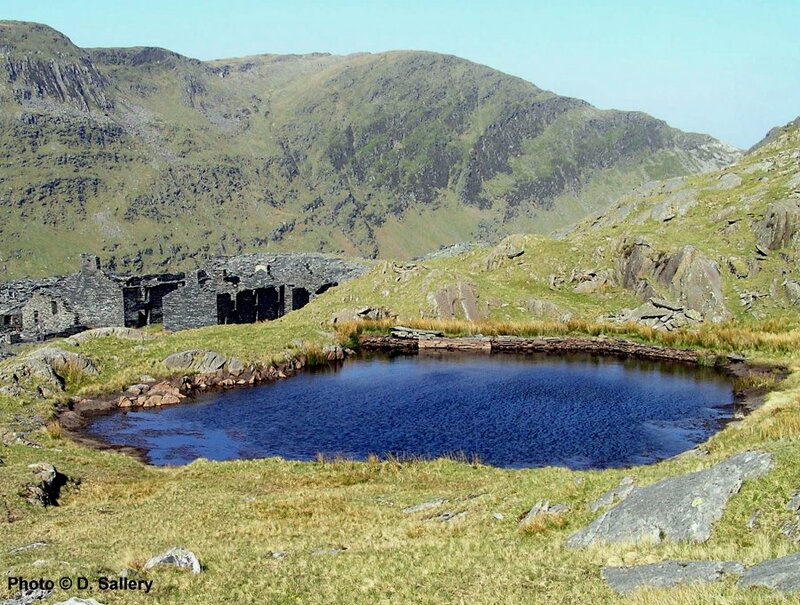 The water from this lake was fed to Llyn Coed, the last link in the supply chain which lay below in the centre of this view. 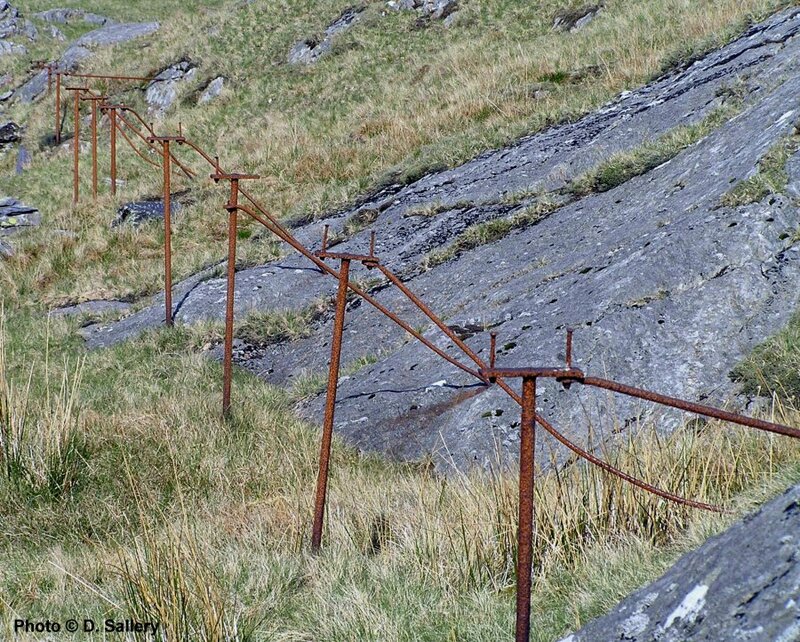 These metal supports would have supported a wooden channel along which flowed water from one of Rhosydd's many reservoirs to one of the quarry waterwheels. This massive construction was built to hold a 40 foot water wheel . It may be seen at the entrance to the quarry from Cwmorthin. The water supply to this wheel would have reused the waste water from an existing waterwheel supplying the main mill. Why a wheel was never installed here is unclear but it was probably due to the economic downturn in the industry. 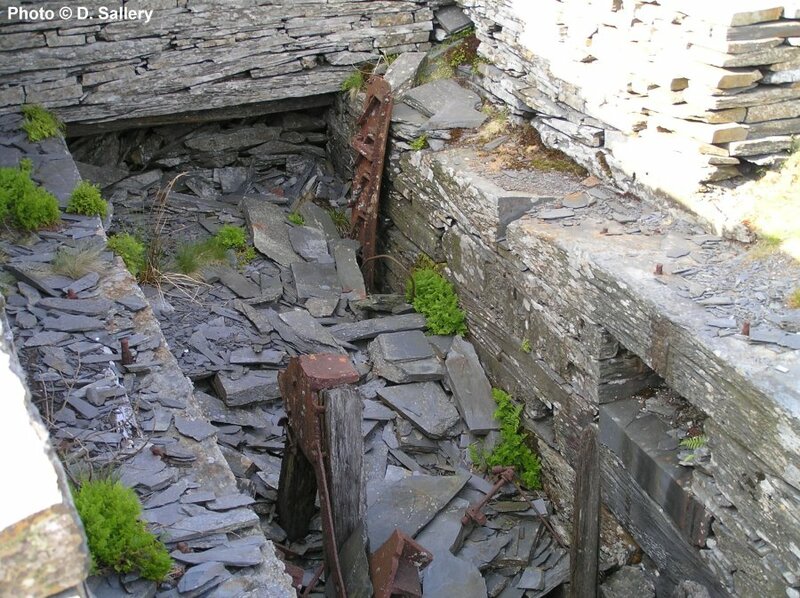 A water wheel pit, a small remnant of the wheel remains.